Inrastructure is clearly in a good place right now. The fact that nearly three quarters of respondents to the latest Infrastructure Intelligence Pulse survey said they are confident or very confident about future business prospects underlines this, writes Infrastructure Intelligence Editor Antony Oliver. It is a confidence which stems from the continued upturn in the UK economy and the positive noises coming out of government around the need to keep investing in our infrastructure as a means to boost productivity. Yet while this latest survey certainly paints a positive picture, it also makes clear that businesses across the infrastructure sector – big and small – recognise that the next five years of Tory government will be tough. Boosting productivity is at the heart of the government’s economic agenda. If we are to deliver the ambition stated aim of cutting up to 40% from the budgets of unprotected public departments, driving up the nation’s productivity is now key. However, what is clear from the Pulse respondents is that this drive towards efficiency is still too firmly rooted in a drive towards lower cost rather that greater value. For many, particularly as business consolidation continues and global competition bites, the outcome is too often still just a race to the bottom. That is bad news. Because as the survey respondents also point out, low fees and wafer thin margins severely impact the ability of businesses to invest in the new and innovative ideas, techniques and skills that will be vital to turn grown into sustainable profitable growth. And that is just where the sector does not want to be. Growth is critical and is certainly achievable across the infrastructure market. Profitable growth remains harder. One key challenge coming out of this survey is, therefore, finding ways to use this current confidence raise profit margins so as to allow firms to invest in the training and skills needed to secure the future. One solution, it seems, will require more focus on delivering greater whole life value from assets rather than just lower project delivery costs. Only then will we see greater, more sustainable returns down the supply chain. As the survey points out, the next few years look like being very exciting for the sector. But they also look set to be hugely challenging. The message from business leaders is clear – boosting productivity will require new thinking - and new business models. The latest survey of 164 business leaders finds 59% of respondents are confident about the sector post election and a further 10% are very confident. Only 7% said they were worried. “Post election the Government has recommitted to its previous pro-infrastructure policies, avoiding any hiatus for projects, and furthermore has made a series of announcements which will drive even more infrastructure spend,” said the CEO of a consultant pointing to the productivity plan, Northern Powerhouse and the willingness to embrace fiscal devolution as positive signs. “With business sentiment at a high, and UK economic performance well ahead of the rest of Europe, private money is pouring into the industry too,” he said. Economic stability was also boosting confidence. “The stability and likely longevity of a Tory government has undoubtedly bolstered financial markets and investor confidence. This is already translating into more confidence in the private sector development arena, which is a catalyst for strong and sustained investment in infrastructure,” said another consulting CEO. Respondents pointed to schemes such as HS2, smart motorways, the Thames Tideway and Hinkley Point C nuclear power plant as examples of major infrastructure schemes that were moving ahead, but they expressed concern over potential spending cuts, cancelled rail plans and uncertainty over energy projects, particularly renewables. “I have strong concerns about the new government position on renewables. This creates considerable uncertainty for the industry with implications for UK energy provision. This is the opposite of what is needed to maintain energy security and transition to a low carbon economy; the industry (and UK) needs policy stability and certainty for energy investment,” said one consultant. Such fears left 24% of respondents unsure about the future for UK infrastructure under the new Government. “Whilst there is strong commitment to investing in Infrastructure, government bodies are being asked to review significant cuts between 25-40%,” said the CEO of an engineering company. The impact of this had yet to manifest itself in the future workload pipeline, said respondents noting that when it did the position for the industry will become clearer. As the cost cutting challenge rolls out firms will need to be more innovative and find new ways to do things. However, innovation is suffering due to low fees, which have not recovered to the peaks prior to the global credit crisis. Only 24% of the 164 business leaders that participated in the survey have experienced fee recovery to pre recession levels and 48% said they remained lower. Over 50% said that consultants needed to charge more. “We need to increase profit margins to properly invest in growing our businesses and paying higher salaries to attract and retain talent,” said the CEO of a consultancy. “We are an undervalued profession and there is now a talent shortage so we need to charge more to pay more and retain skills within the sector,” said another consulting CEO. Respondents noted that fees had risen in the private sector but said that for public sector clients there was renewed pressure. “We have had to reduce fees by 9% this year due to pressure from a public sector client,” said the CEO. Others pointed to competition from growing firms. “Large acquisitive consultancies are seeking turnover keeping fees low,” said one director. “The problem is suicide bidding to buy a position, especially from the very largest multi-disciplinary; it has a very bad effect on more specialist tier 2 companies,” said another consultancy director. Firms said that low fees meant no time to innovate with thinking time being a luxury that clients don’t want to pay for, pointing out that for every new idea that brings innovation there are several more that do not. This makes it easy for innovation to be seen as not productive they said. “Innovation requires time and time is money. Consultancy is a service industry all we are doing is selling our time. Low fees equal the poor quality of service too often provided and has resulted in overseas constructors being more innovative than UK operations,” said a business director. To encourage innovation some respondents called on firms to change their business models and drop the fee based structure in favour of more value based calculations. “Selling hours is unlikely to result in the ability to charge more. It is vital that consultants sell value and communicate that value,” said a consulting director. 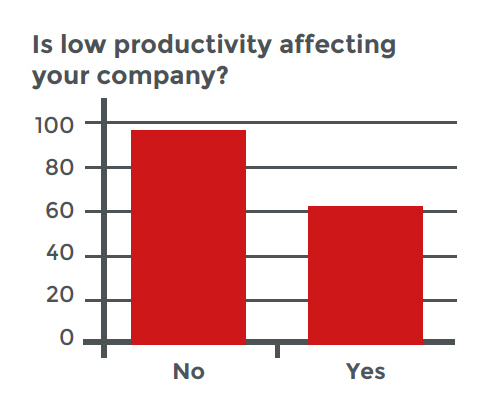 For 40% of firms productivity is also an issue and they are not alone. The UK government has identified low productivity as being a barrier to growth. “Low growth in productivity is a recent feature of the UK economy but a long-standing feature of the UK construction industry,” said the director of an infrastructure company. “Productivity has not improved for more than twenty years. The impact of this is costs that are 10-40% more than in comparable European economies and investments that are shelved because they are too expensive,” he said. From a policy perspective respondents pointed to Government announcements on rail, energy, devolution, and roads as being significant to their businesses this year. In the first budget following the general election chancellor George Osborne announced that vehicle excise duty (VED) would be channelled into road spending by 2020. Such a move was considered by 49% of senior professionals to be one that would lead to improvements in the road network. “It creates a consistent stream of revenue allowing better programming of investment in roads,” said the CEO of a trade organisation. A further 39% said that they did not know if it would improve the road network pointing to a lack of detail about how the money would be allocated. Just 12% said that it would not improve the network fearing that central Government funding would be cut by the same amount or more. But other sectors such as rail and energy were mentioned more frequently by firms. “Most critical has been the pause in the Network Rail spend, resulting from an under-spend in the first 6 months and the escalating price they are paying for electrification and signalling,” said the director of a contractor. Government has also announced cuts to renewable energy incentives, affecting biomass, small scale solar energy and onshore wind energy, moves which were described by respondents as “backwards thinking”. Not only is this setting the UK on a path towards missing its 2020 renewable generation targets of 15% of total, but it is also limiting future markets and opportunities for companies in the sector. Aviation policy was mentioned too with firms welcoming a decision from the Davies Commission that additional aviation capacity should be provided through a third runway at Heathrow but they questioned when Government would act on the findings. 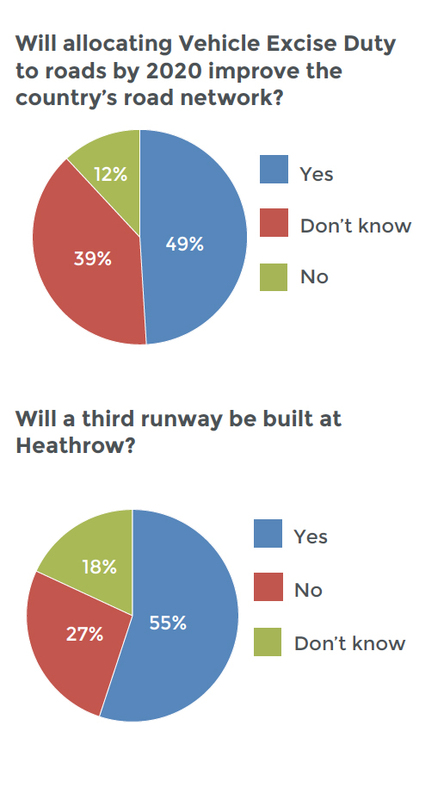 Over half (55%) of respondents said they thought that the third runway would be built. “It will be very difficult not to endorse the commission’s report given how strongly it came down on the need to progress the third runway at Heathrow,” said a director at a consultancy. Just 27% said that it would not be built and 17% were not sure. Being productive means keeping staff churn low. Pulse respondents demonstrated a high level of loyalty to their employers with 64% serving more than 5 years with their companies and only 36% moving more frequently than this. This is in contrast to the Retention Gap report of July 2015 which found that 73% of staff serve less than 5 years with an employer. Among the most commonly cited reasons for employer loyalty were the opportunities provided for career progression as well as a high level of job satisfaction. Working for supportive managers and good colleagues were also important to respondents along with a variety of work and good training and development. Flexibility and achieving a good work life balance were important too, ranking above pay or benefits. The survey also revealed that 61 per cent of senior infrastructure professionals have had a pay rise this year. For 53% of respondents this was 1- 3%, but a further 33% reported a rise of 4-7%. For 15% it was higher than 7% and 4% reported pay rises through other mechanisms such as bonuses or shares. Employers were also found to have a high level of adoption of policies to encourage diversity and inclusion with 88% of companies reporting such measures were in place. “This is critically important if we are to tackle the skills gap in any meaningful way,” said a consultancy CEO. “EDI [equality, diversity and inclusion] are no longer just nice to haves. Clients are demanding that compliance is clearly evidenced in bids,” said another consulting CEO.